I hadn't actually planned on starting Beastly Bones so soon after finishing Jackaby, as my TBR is pretty full at the moment, but once I discovered that my library had the audiobook for it, I couldn't wait to dive back into the story with these characters that I've come to love so much! I said it before in my review for Jackaby, but I'm going to say it again here. Abigail Rook is awesome. She's definitely my most favorite character in this book. I love her determination and persistence. And I really adore Jackaby as well. I love how wonderfully peculiar he is, and, he makes me laugh so much. I'm always looking forward to what he's going to get into next. While we are introduced to some interesting new characters in the story, all of my favorite secondary characters are along for the ride in this sequel as well, including Charlie, who is so super sweet. We didn't get to see much of Jenny and Douglas this time around, but I'm hoping we will see more of them in the next book. I love that the storyline for this book was completely engrossing as well as entertaining. It definitely held my attention. I love the mystery and historical parts of the story just as much as I love the supernatural parts. It really makes for a great read. This story was a little different than the last book, but I still enjoyed it nonetheless. 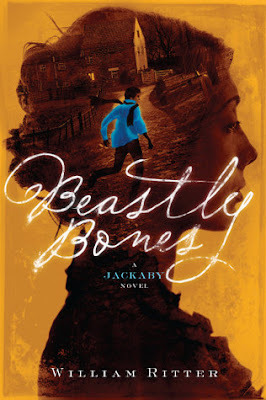 Overall; Beastly Bones was an excellent follow up to Jackaby! I really enjoyed this book so much. Now that I've finished the first two books in the series so quickly, I can't wait to get started on book 3, Ghostly Echoes, which I'm hoping to start as soon as possible. And I'll be anxiously awaiting book 4's release in 2017!